Detecting an infectious disease is almost, by definition, an after-the-fact-activity, and preventing its spread requires real-time information and analytics. Acting quickly with accurate information can have a profound impact on the lives of people around the world, socially and economically. To help address this critical concern, many researchers are turning to the Internet of Things (IoT) to collect sensory data in real-time – something that until recently was impossible to do. It involves tracking people, health systems, and environments, sometimes in some of the most remote regions of the world. With the emergence of IoT and big data analytics in healthcare, data can be collected now from places where previously it was either done manually or not done at all. For example, smart thermometers are feeding data in real-time to global medical systems; bench-top analyzers are analyzing patient samples instantly and sharing data in real-time with disease monitoring tools installed miles away. At theVirginia Tech Network Dynamics and Simulation Laboratory, disease monitoring tools such as HealthMap and EpiCaster are merging IoT data with population data, GIS data, land-use information, social media streams, and other sources to detect emerging public health threats like Zika and H1N11. 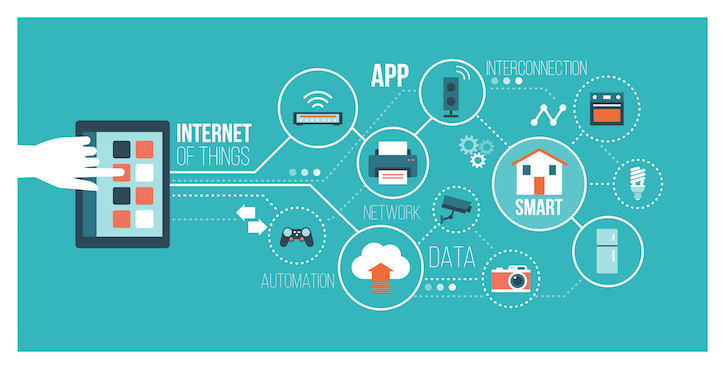 Since IoT is a network of interconnected systems, machines or objects with sensors can all be connected to each other, without the need for the wider Internet, in remote areas to collect data. This data can eventually be connected to the wider network to integrate it with the global health data system to not only track diseases in real-time but also to apply predictive analytics to prevent their spread. An interesting example of how IoT is transforming lives is the Johns Hopkins Center for Clinical Global Health Education and its use of connected devices to increase patient engagement and help clinicians and nurses at the point of care share information on clinical studies in real-time. Johns Hopkins has deployed this model to recruit participants from across the globe to study the impact of tuberculosis on pregnant women. The software-enabled tablet interface allows the researchers to holistically view patients across all touch points – including their medical histories, treatments, medications, other clinical data, and insights into social determinants – using a combination of visual graphics and charts. It also offers patients easy access to their health data and tracks the progress of their health goals, thus creating greater interest and engagement among participants. “Technology has been particularly important in our evolution and how we are doing our studies as well as how we are collecting the data to really assess the effect of our treatments in our studies,” says Dr. Amita Gupta, Associate Professor of Medicine at Johns Hopkins. Public health organizations can benefit from the experience of organizations such as Johns Hopkins in leveraging IoT-enabled devices and enabling connected health to manage public health crises. In the case of a rising suspicion of an outbreak, health systems can use a network of IoT devices to procure more focused data to pinpoint the source of an epidemic. In the event of a confirmed outbreak, the same network can be used or enhanced to provide the necessary supply of drugs, medical devices and other diagnostic tools. In infectious disease control, the lack of readily available and relevant data required to test a hypothesis has led to a lack of evidence-based approaches. With technology and the advent of IoT, health systems can easily overcome this challenge. By collecting data from remote locations and feeding it into the global health system along with data from other sources, clinical researchers are better equipped to make an evidence-based analysis of an emerging outbreak. Based on this analysis they can suggest preventive measures using data from the IoT network or to further determine if the controlling measures suggested are being implemented properly. In the case of a flu outbreak in the U.S., for example, washing hands and using sanitizers can be easily tracked using IoT-enabled devices, and their impact on the spread of flu can be tracked using the data collected, all in real-time. The role of IoT in connected health and in preventing the spread of infectious diseases continues to grow, along with related new technologies. To be done effectively, however, requires proper planning and careful implementation using the appropriate technology platforms and tools. Thanks to IoT-enabled technologies, identifying and preventing the spread of infectious diseases more proactively than ever before is now a reality. Harshal Shah, Senior Director, Healthcare, Persistent Systems, has spent more than a decade in the healthcare industry, working to define strategies and design informatics solutions for digital health enterprises focused on next generation informatics. He can be reached at harshal_shah@persistent.com.